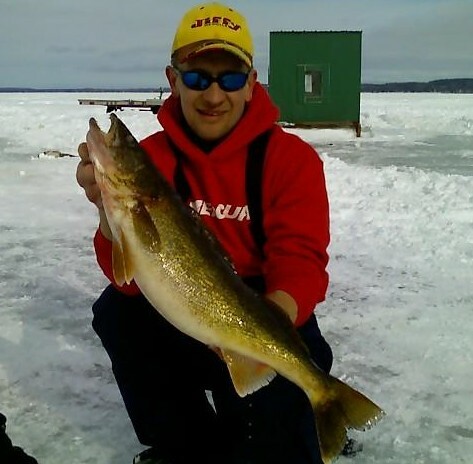 Welcome to Reel Action Ice Fishing Guide Service! on Lake Michigan in Green Bay and Sturgeon Bay Wisconsin. 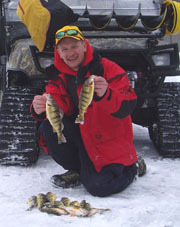 Welcome to the exclusive Door County Ice Fishing website. 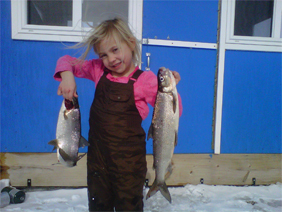 Reel Action Charters Inc. was founded in 1995 and is the largest, most-reputable charter/guide operation in Door County. Over the past 20 years "Team Reel Action" has paved the way for many. It’s this experience, professional guides and charter captains who will guarantee your success and safety. Make no mistake... EXPERIENCE is the key! 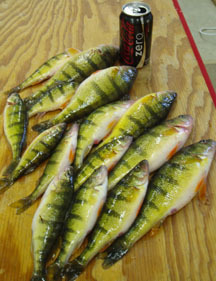 Our diverse fishery offers opportunities to catch Jumbo Yellow Perch, Huge Northern Pike, Big Brown Trout, Whitefish by the bucket, and Trophy Walleye. 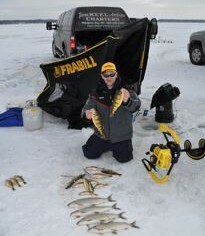 See for yourself why so many come back year after year to go ice fishing on Green Bay and Sturgeon Bay in Door County Wisconsin. 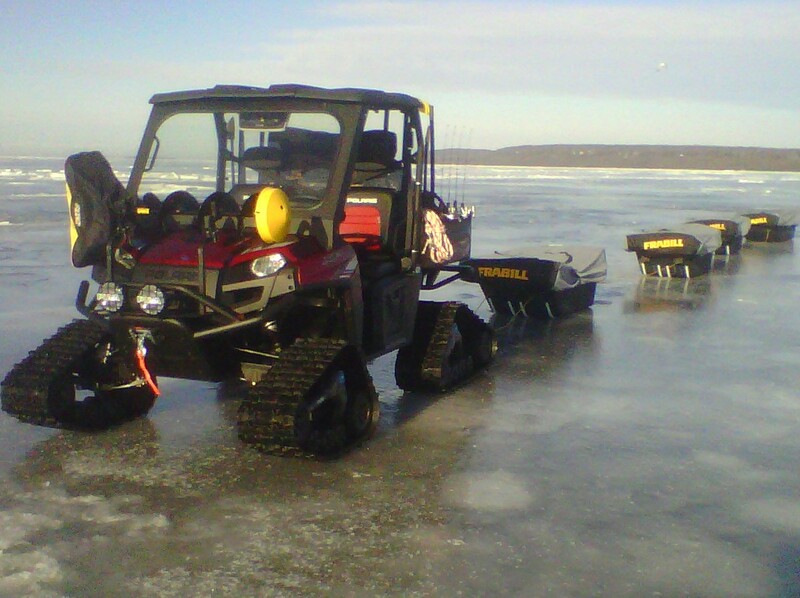 Our 2014 Polaris Ranger 900 CREW CAB LE takes us where others only dream of ice fishing! 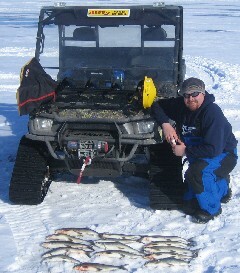 Equipped with Camplast Tracks it is truly the ulitmate ice fishing machine. Fish remote areas in comfort with side-byside seating, custom ice-auger holder, winch, and Lowrance HDS 10. This isn't a 4-wheeler; it comfortably seats 4 passengers and safely transports you to your heated-shanties..
Not only do you get to the hot-spots in style aboard our Rangers, but you can fish in comfort in heated shanties and/or portables. We operate 6 full-sized heated ice houses with wood stoves for warm, dry heat. We provide industry leading gear from Polaris, Frabill, and Jiffy to make fish catching easy and fun!! 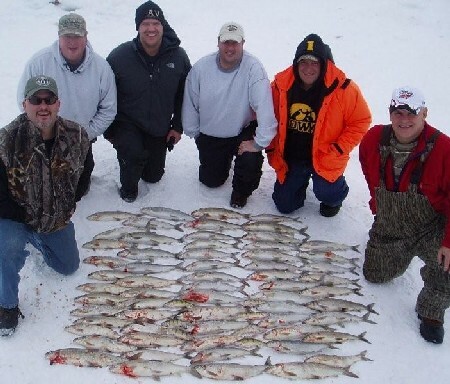 Plan your day for ice fishing now!! Winter opportunities are limited so ensure your outing on the ice by calling us at (920) 360-2136 or drop us and e-mail at: reelaction911@gmail.com. Contract binding upon receipt of 50% deposit. Deposits are non-refundable, but we would be happy to reschedule and transfer your deposit to another date, during the same season, with 30 days notice. If charter is canceled due to bad weather, we will reschedule your time for a different date or refund your money at the captain's discretion.